“West End Musicals In Concert” and “Encore!” – The 3 Tenors – New Performance Dates May and June | Marbella Marbella – Adelante! New dates include venues in Marbella, Estepona, Puerto Banus, Nueva Andalucía, Coin and Mijas. More dates to be added soon, including in Gibraltar and other parts of the Costa del Sol. 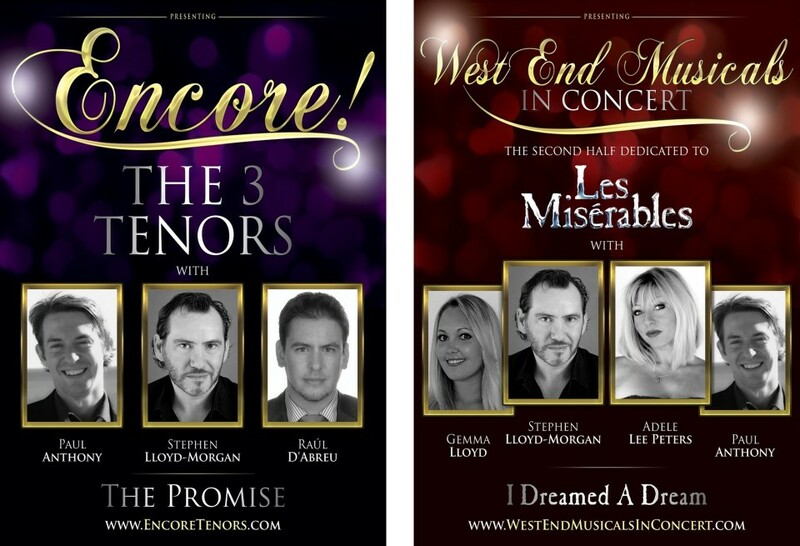 Popular International Tenor Stephen Lloyd-Morgan joins forces with the three amazing voices of Adele Lee Peters, Paul Anthony and Gemma Lloyd to bring you ‘West End Musicals in Concert’. A Concert comprising highlights and showstoppers from the best of Musical Theatre, and currently featuring a second half dedicated entirely to the multi-award winning show ‘Les Misérables’. Stephen Lloyd-Morgan is invariably referred to as “Marbella’s favourite Tenor” & “is without doubt, the best tenor on the Coast”. He is an experienced Musical Theatre performer who studied at The Mountview Academy of Performing Arts in London. He also studied Opera at the Welsh College of Music and Drama. Reservations: 952 815 208 – N.B. Please call for availability as this is initially a club members and guests only event. Popular International Welsh Tenor Stephen Lloyd-Morgan joins forces with the two amazing voices of Spanish Tenor Raúl D’Abreu & English Tenor Paul Anthony to bring you ‘Encore!’ – The 3 Tenors – featuring amongst other songs Granada, La Donna Mobile, Caruso, Funiculi Funicula, O Sole Mio, Besame Mucho, Volare, Somewhere, Brindisi & Nessun Dorma. Stephen Lloyd-Morgan is invariably referred to as “Marbella’s favourite Tenor” & “is without doubt, the best tenor on the Coast”.He is a very experienced performer who studied Opera at the Welsh College of Music & Drama and Musical Theatre at The Mountview Academy of Performing Arts in London.